New Athletic Director William Walker stands at the podium at Bender Arena. Photo courtesy of AU Athletics. At a press conference today in Bender Arena, home of the Patriot League’s American University Eagles, AU President Neil Kerwin announced the appointment of Dr. William (Billy) Walker, deputy director of athletics at the United States Air Force Academy, as the university’s 14th director of athletics and recreation. Walker will join the AU staff in April. At the Academy, Walker most recently served as professor and head of the Physical Education Department and deputy director of athletics. He was responsible for day-to-day operations of the Academy's athletic department, including 190 employees, 23 NCAA Division I Olympic sports, and a multifaceted program involving physical education, cadet fitness testing and evaluation, and an intramural program for more than 4,000 cadets. 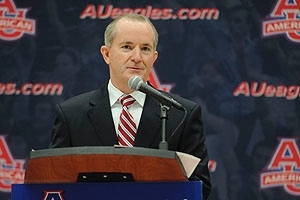 "I'm tremendously honored to be selected as American University's next director of athletics and recreation. President Kerwin's confidence in me is truly humbling, and I can't overstate how appreciative I am. Everywhere I've been on campus, I've met people who are part of an integrated team of professionals. I'm thrilled to be joining that team and I can't wait to get to work," said Walker. In his various appointments at the United States Air Force Academy, he also served as a physical education instructor, assistant wrestling coach, and director of the Fitness Testing and Evaluation Division. In 1993, he earned the Academy's highest instructional award. In 2001, Walker was appointed by President Bush as the first Permanent Professor of Athletics and Physical Education. A recognized expert in intercollegiate athletic issues, Walker has served as chair of the NCAA Division I Wrestling Committee and is a member of the NCAA Division I Men's Ice Hockey Committee. An expert panelist for the U.S. Department of Education and a key participant in the merger between two lacrosse leagues, he also spearheaded the formation of the Western Wrestling Conference in 2005, and still serves as its commissioner. A native of Wisconsin, Walker graduated from the United States Air Force Academy in 1983 with a Bachelor of Science. He earned a Master of Arts from California State University and his doctorate in physical education and sports administration at the University of Northern Colorado. A command pilot with nearly 3,000 hours of helicopter flight time, Walker’s professional responsibilities have included deputy command of the 89th Operations Group, an organization of 800 people responsible for directing the safe transport of the President of the United States, Vice President, Cabinet Secretaries, members of Congress, foreign heads of state, and other dignitaries around the world. His roles at Andrews Air Force Base also included commander of the 1st Helicopter Squadron and experience as a military assistant to the Presidential Inaugural Committee. Walker replaces former director of athletics Keith Gill, who left AU in December to become University of Richmond’s director of athletics. American University’s intercollegiate athletics program includes more than 250 student-athletes competing in 16 varsity sports. A member of the Patriot League since 2001, AU teams have won 68 league titles and earned 43 berths into NCAA championship tournaments. Last academic year, AU’s scholar-athletes earned a 3.37 average GPA, and the graduation rate of student-athletes who exhausted their eligibility was 97 percent. Additionally, four student-athletes earned the Patriot League Scholar-Athlete of the Year award, and 121 student-athletes were named to the Dean’s list.